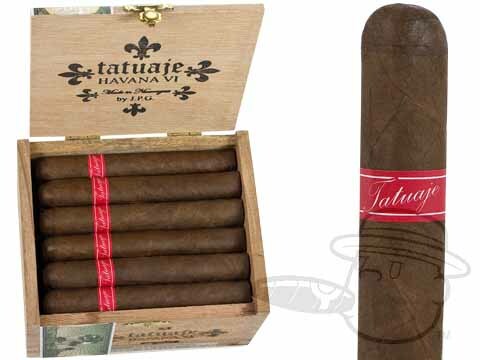 Tatuaje Havana VI is a Nicaraguan puro that is made in the traditional Cuban style. Ribbon-bound and packaged in wooden cabinets, these cigars are beautifully rolled and topped with a Cuban-style triple cap. The Havana VI line is medium-bodied with notes of cocoa, pepper and rich tobacco with some sweetness to round out the smoke. Good small cigar, but rather pricy. Excellent small cigar. Gave a few to cigar smoking friends and all were impressed. Purchased a box and will buy again during a BCP sale. These cigars burn for just the right amount of time and are small enough that if I have to toss it early I don't feel guilty. Great flavor and complexity. I bought a box of 50 similar cigars from Tatauje in hopes they are this good. Awesome daily little flavor bomb. a great stick. superb flavor and quality construction. excellent combustion and burns evenly. great to the finish. Delicious medium bodied cigars with the perfect draw, size and smoke. Inconsistent quality cigars. Will not buy again. Tried an Artista was great cigar so I had to try a box of these and wow smaller size but with big flavor amazing stick thank you BCP. Tatuaje Havana Vi Angeles is rated 4.5 out of 5 based on 8 customer ratings.